FTB500 series low flowmeters offer extremely accurate low flow measurement of liquids. They utilize a pelton wheel-like rotor whose motion is converted by a pickup coil into a pulse output that is proportional to flow . Each flowmeter comes with an integral signal conditioner, powered by either 15-35 Vdc or 115 Vac (opt.) to provide amplified frequency and analog outputs. The signal conditioner corrects for the inherent zero offset of the flowmeter pulse output. 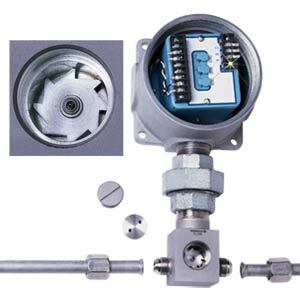 It is mounted in a NEMA-4, explosion-resistant enclosure rated for class I, groups C & D, class II, groups E, F, and G.
Connections: ½" 37° flare per MS-33656-8; ½ MNPT adaptor kit opt. ALL MODELS ARE CUSTOM, PLEASE CONSULT FULL SPECIFICATION PAGE FOR DETAILS. 참고: Comes complete with operator's manual and 10-point NIST calibration ceertificate for 1 centistoke of water. (*CK) Specify liquid viscosity (in cSt), from 0.8 to 25 cSt. For viscosities other than 1, add $625 to price. To order with 115 Vac power, add suffix "-115VAC" to model number, add $100 to price. Standard max pressure is 1000 psig. To order with option 6000 psig max pressure add suffix "-6KP" to model number, add $250 to price.